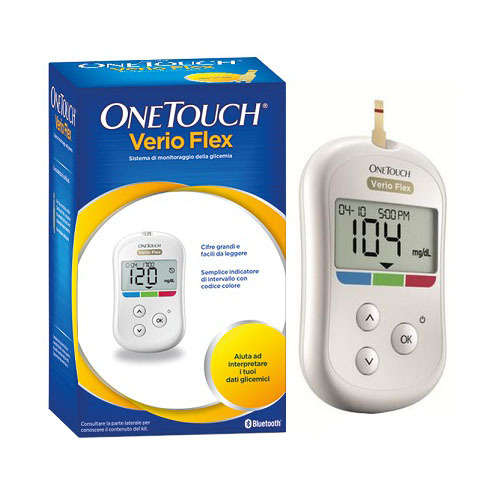 The OneTouch Verio Flex™ Blood Glucose Monitoring System is intended to be used for the quantitative measurement of glucose (sugar) in fresh capillary whole blood samples drawn from the fingertip. The OneTouch Verio Flex™ Blood Glucose Monitoring System is intended for self-testing outside the body (in vitro diagnostic use) by people with diabetes at home and with their healthcare professionals in a clinical setting, as an aid to monitor the effectiveness of diabetes control. The OneTouch Verio Flex™ Blood Glucose Monitoring System is not to be used for the diagnosis of or screening of diabetes or for neonatal use. The system is intended to be used by a single patient and should not be shared. ColourSure™ technology instantly shows when blood glucose results are in or out of range. Compact, slim design that’s easy to take with you. Compatible with: OneTouch Verio® test strips, OneTouch Verio® control solution and OneTouch Reveal® mobile app. Kit includes: OneTouch Verio Flex™ blood glucose meter, OneTouch® Delica® lancing device, OneTouch® Delica® lancets, carrying case, Owner’s booklet and get started guide.